Janmashtami celebrates the birth of one of the most famous Gods of Hindu religion, Bhagwan Krishna, on the eighth day (Ashtami) in the month of Sravana or Savana. 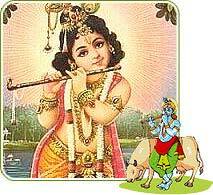 Lord Sri Krishna was born on the 'Rohini' nakshatram (star). It is generally celebrated in the month of August-September according to the Christian Calendar. Legend has it that Sri Krishna was born on a dark, stormy and windy night to end the rule and atrocities of his maternal uncle, Kansa. It was only on the eighth day of the second fortnight, in the month of Sravana when, the moon entered the house of Vrishabha in Rohini Nakshatra (star) that Lord appeared. According to Barhapatyamana, the month of Sravana corresponds to the month of Bhadrapada Krishnapaksha. Lord was born in the year of Visvavasu, appx. 5,227 years ago. Janmashtami is celebrated for over two days as "Rohini" nakshatra and Ashtami may not fall on the same day. The first day known as Krishnashtami, as the birth of Bhagwan Krishna falls on the eighth day after Raksha Bandhan, which generally falls in the month of August. The second day is known as Kalashtami. It is only at midnight between the first and the second day that birth of Sri Krishna took place. The actual festivities begin during midnight in this 48 hour period. The celebration reaches its peak at midnight, with the birth of Lord Krishna, with lot of hymns, arti taking place and blowing of the Conch (shankh), rocking the cradle of Lord. The idol of lord is bathed with Panchamrit (A mixture of milk, ghee, oil, honey and Gangajal). The Panchamrit is later distributed as Prasad to the devotees along with other sweets. While some Fast on the first day and break it at midnight for others the fasting continues for both days. The period coincides with rainy season.